Student Planner. 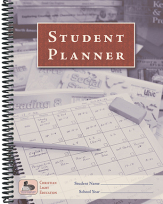 Designed especially for homeschool students, this 8 ½” by 11” planner comes complete with a weekly chart to record appointments and action lists, a place to chart daily goals, a weekly memory verse, student self-evaluation check, and a journal to log activities such as field trips. 214 pages. Goal Charts. These compact 5 ½” by 8 ½” charts are a convenient tool to set and track daily goals for students. One week per side. Fifity double-sided charts per pack. Parent Training Course. The parent training course that is included in the Homeschool Plus enrollment is also available without the Homeschool Plus services. Click here for enrollment form and fees. The Homeschool Handbook is loaded with tips, inspiration, and guidance. Though primarily written for CLE homeschoolers, most of its material is relevant to non-CLE homeschoolers. 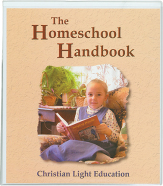 The Homeschool Handbook is a tool for parents who teach their children at home. This handbook contains both principles and procedures to help you operate a successful homeschool. Item: 810052 Pages: 274 Size: 10 x 11 1/2 Binding: Binder Publisher: Christian Light Publications, Inc.